There's some big news to deliver first thing. Congratulations to Elizabeth Toy who is the winner of my giveaway from last post. A copy of Scientifically Sweet: A Scientific & Delicious Approach to Artisanal Baking is in the mail and I hope you bake your local shop outta sugar! Now here's some less exciting and more absurd news... I'm watching Dr. Oz rub egg whites all over a lady's face. Apparently it reducing wrinkles, but all I can think about is how she now has Salmonella in her pores. But I figure this might be a good time to introduce a really super healthy, no refined sugar-added, butter-free snack. I'd hate for Dr. Oz to stumble upon my latest back to back posts about Chocolate Chocolate Peanut Butter Cookies and White Chocolate Chunk Chocolate Cookies and then make a flashy episode showing the audience a grossly grey shriveled up organ with fat build-ups and cloggages to demonstrate (in major exaggeration) how terrible cookies are for you. Hello! Hasn't anyone ever told you that moderation is key Dr. Oz? Lay off it. So this is for good measure, and because they also taste lovely with a cup of tea at breakfast and for a snack at around 2 pm when something sweet but satisfying becomes absolutely necessary! 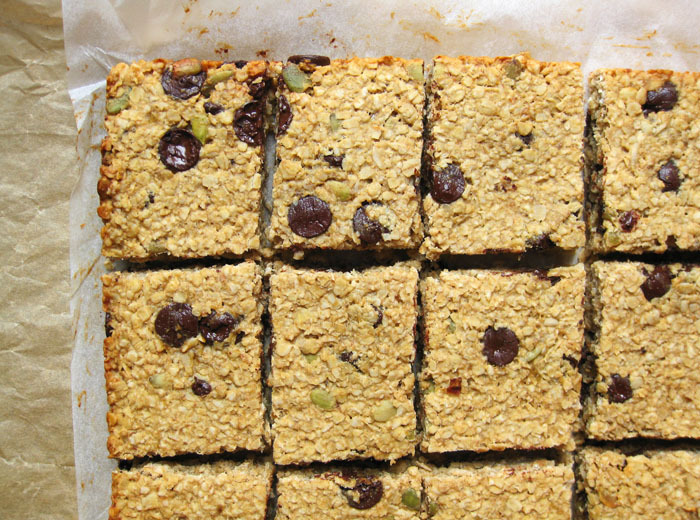 There isn't much to this batch of delicious - just a few totally major ingredients like bananas, peanut butter, honey, dark chocolate, oats and pumpkin seeds. An egg and a few short steps helps bring it all together. Notice there's no butter and barely any added sugar? Just two measly tablespoons of honey. It's entirely not like me. I was way out of my comfort zone. It felt weird and exhilarating all at the same time. The blend of banana, peanut butter and honey is so undeniably comforting that you are guaranteed to be licking the spoon after the first hmmm... four steps of the recipe. Let's see... 1. Preheat oven. 2. Line your pan. 3. Mash bananas in a bowl. 4. Mix in peanut butter and honey (insert "lick spoon, dip finger in bowl, lick finger" *here*). Believe me, this WILL happen. If your bananas are nicely speckled black, they are ripe enough to add just enough sweetness with the bit of honey to make this taste just right. The protein in the peanut butter combined with a whole egg is enough to hold the mix together. Quick oats will set quicker than rolled oats and their natural fibres will solubilize and act as a bit of glue to hold it together as well. The end result will be a soft and tasty breakfast bar that is soooo filling and satisfying - like a pimped up bowl of porridge in a square. And, every time you bite into a bittersweet chocolate button your tastebuds will cry tears of joy because chocolate just met peanut butter and banana and nothing compares to how amazing that union can be. Preheat your oven to 325°F. Line a 9x9-inch baking pan with parchment paper leaving a 2-inch overhang at each end. In a medium bowl, mash the bananas well with a fork. Mix in the peanut butter and honey until smooth. Add the egg and whisk until well blended. Stir in the oats and seeds until completely coated with the wet mixture. Fold in the chocolate chips. Press the mixture evenly into the prepared pan and bake for 25-30 minutes, or until golden brown around the edges. Transfer to a wire rack to cool completely in the pan before lifting out and cutting into bars. 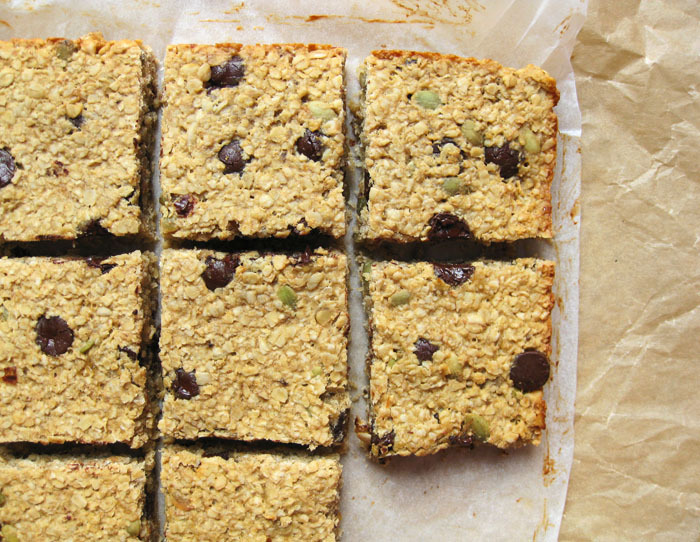 These look great!I love that they are sweetened mostly with the bananas! Definitely go with 90% chocolate - that would be really nice. You can use any seed in place of pumpkin if you like. Chia seeds will impart a bit of a slimy texture, so just be aware of that. I just made this! (I had another similar recipe that was cookies that I was going to do but it only needed 1 banana and I had two so I figured I would try this one instead!) Delicious! I love that they have no added sugar (besides a little honey) and that they have PB & banana! I added a little cinnamon and coconut instead of seeds! I think I could eat oats every day for the rest of my life and not get tired of them. Every time I try healthy baking with them, though, it turns out a little gummy and soggy. I'll have to give this a try! Thanks for the recipe.